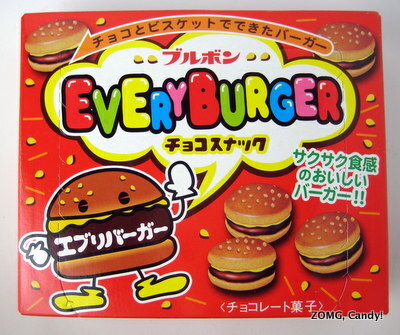 This box of Everyburger was an impulse buy at my local Asian grocery store. 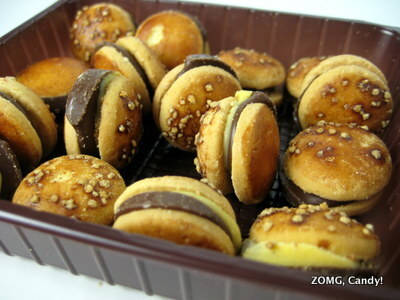 I couldn’t read a word on the package besides “Everyburger”, but the box was shelved with other chocolate+cookie treats, so I assumed that these were some sort of chocolates+cookies shaped to look like hamburgers. Fortunately, my assumption was correct, and I didn’t accidentally buy some weird shelf-stable normal burgers in a tiny box. The Everyburgers were made of two nickel-sized cookies sandwiching a chocolate patty that was topped with a little schmear of frosting cheese. The cookies had a soft crumble with a mildly sweet, buttery flavor. 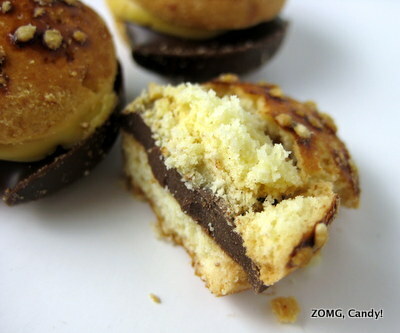 The top bun had some fake sesame seeds that added a toasty crunch and an edge of burnt flavors. The chocolate was standard – it was sweet and thickly creamy with a caramel finish. The “cheese” was creamy but didn’t carry any specific flavors. Altogether, the Everyburger was a nice mix of flavors and textures packaged into a cute bundle. An OM.